Forum moderators are given broad discretion in interpreting the rules in order to keep our community safe and welcoming. At the same time, we don't want to unnecessarily interfere with our members' rights to express themselves. There's a delicate balance to be found between protecting our members and allowing freedom of expression, and that line extends beyond the admin function of approving or rejecting new members. Edit the post in question to remove the violation. Move the content to the Questionable Posts forum for discussion with other moderators. Editing a member's post is something that should be done only very rarely, and we must take care never to alter the tone or change the message the member originally tried to convey. If there's just one tiny bit off in the post- say, an email address published in public - feel free to remove it and replace it with a note explaining the edit you made. If your concern is any bigger than that, move down the list. If you ever do make an edit to a member's post, be sure to send them a PM explaining why. When a post or image is clearly in violation you can, at your discretion, delete it entirely. Again, if you go this route, PM the member to let them know why their post was unacceptable. In either of the above cases, your PM to the member should include a link to the community rules and a note encouraging them to re-read and familiarize themselves with what is and isn't okay in the forums. If you're just not sure whether a post qualifies as a violation or if it doesn't fit an established rule, shuffle it to Questionable Posts for team discussion and we'll decide together what to do about it. Every now and again, you'll see a member who develops a habit of skirting - or stomping right across - the line in multiple posts. When you spot such a pattern, please create a new topic in Questionable Posts to call attention to the member and their problematic behavior. At that point, someone on the admin team will likely step in to issue a stern warning or ban the member as appropriate. Accessed via the dropdown menu by your name, this control panel gives you some options for managing content and members. Reported content should be cleared out regularly, as the vast majority of it consists of false positives that occur when crawler bots click the "report" button within a post. The approval queue is no longer used, as members post freely these days. 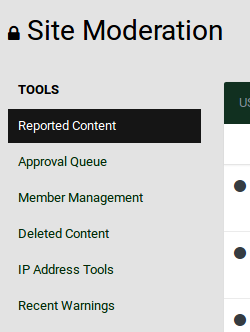 Member management will show you a list of banned members and allow you to search for profiles to edit. Answers from members on their profile questions should never be changed, but by clicking in to edit a profile you can view answers to questions that are hidden from the general public. In the deleted content menu, you can view and restore any content that was removed within the last 30 days. 30 days after an item is removed, the system purges it and it can no longer be replaced. IP address tools lets you find out which IP addresses have been used by a particular member, or get geolocation data for an address you provide. Any information you get using this tool should be taken with a grain of salt, as IP addresses are no longer anywhere near as reliable as they used to be and can be changed in under 30 seconds. Finally, the Recent Warnings list should always be empty. We don't use the warning system, so if you see something in here you should probably poke an admin. Pictured above, left is the list of moderation options you'll find above every original topic in the forums. To the right is the smaller list of options available for comments on original content. Pinning a topic shuffles it to the top of all topics in its container forum where it will stay regardless of new content posted after it. Pinned posts get cluttered very easily, so we should be very judicious in our use of this function. If you come across a post with important advice and don't see something similar pinned, though, don't hesitate. Hiding a topic leaves it in its place in the published order of the forum in which it was posted, but conceals it from everyone who doesn't have the right privileges to see it. We don't use this option much, as questionable content should always be moved to Questionable Posts for discussion. Locking a post prevents members from adding new comments in that thread. This is a useful feature for discussions that get out of hand, or that are about to go off the rails. We don't often see a need for this, but it's good to know it's there in case tempers flare. Moderators and admins can still add comments to locked posts. 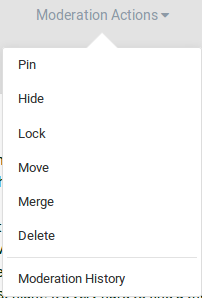 Selecting the "Move" option will bring up a list of forums, from which you'll choose one to move the post into. This is how you would get a topic into Questionable Posts, for example, or how you would move something from the wrong forum to the right one. When moving a topic, it will always ask if you want to leave a link to the new location. Please always answer "no" to that question. Merging a post will prompt you for the URL of a different topic in the forums. You'll then be prompted to choose which of the two topics should be the primary one listed. Going forward will then combine one topic and all of its comments into a single thread at the URL you designate. While admins and your fellow moderators will be happy to answer any questions you may have, it is our sincere hope that you find the "delete" option to be self-explanatory. 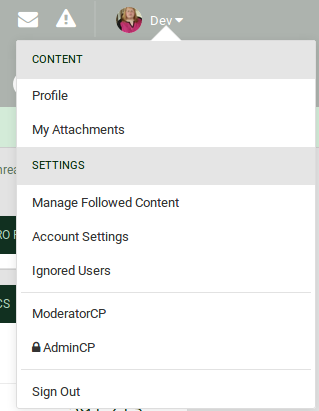 Selecting the moderation history option will show you a list of all mod actions taken for that particular topic. Finally, the "Split" option - available only on comments - is what you would use to move a comment out of its current thread and into another location. If a comment looks iffy and you'd like input from other team members, use this option to split it out and place it in Questionable Posts.